The correlation between pandemics and drops in atmospheric CO2 concentrations was suggestive, but what was the connection? How could plague and other diseases cause the drops in CO2? Part of the answer to these questions comes from historical records summarized in chapter 13. These records document abandonment of farms and farm villages on a massive scale during and after all three major pandemics. In the wake of the European plagues, abandoned farms are described as having gone to waste or ruin. Those words bring to mind doors flapping in the breeze, roofs sagging and collapsing in upon houses and barns, and wild vines creeping up and strangling rotting fences. But nature was doing much more than that. Nature was busy turning pastures and croplands back into forest, and remarkably quickly. A little over a decade ago, we bought the property where we now live. The former owner had begun a small Christmas tree farm in the lower part of the meadow where our house stands. He kept most of the meadow in good trim by "bush hogging," a method far cruder than cutting hay. The drive from a tractor spins a blunt blade that whacks down the grass by brute force, along with anything else that sprouts (saplings, shrubs, etc). Two summers had passed between the time when we bought the land and the point when house construction started, and in that short a time the meadow had begun to be invaded by forest. Young cedar trees sprouted along the meadow edges where berries fell from mature trees in nearby woods. Locust saplings sprouted well out into the meadow by a combination of root propagation and seed dispersal by pods. Several kinds of shrubs and cedars that had been whacked down but not killed by bush hogging also started to grow here and there. This meadow had no fences, or otherwise the birds would have started rows of trees on the ground just below by depositing seeds in ready-made fertilizer capsules. To me, a product of the suburbs, this instant eruption of trees was astonishing. It made me realize how much work it takes to keep a meadow a meadow. You can always put livestock out to browse down the invading vegetation, but only goats eat everything in sight. Extra cutting is needed to fight off tree and shrub invasions in fields with only cattle or horses. Robert Frost might just as well have written "Something there is that doesn't love a meadow." In all naturally forested regions, forests can reoccupy abandoned pasture or cultivated land with amazing speed. History shows that many farms in Europe were not reoccupied for many decades or even a century or two after major plagues. The amount of time until reoccupation depended in part on whether or not the plague outbreaks repeated, thereby keeping populations low and people off the available land. In the absence of humans, vegetation began to reclaim the farms, and as it grew it pulled CO2 out of the atmosphere. Based on field evidence and models, ecologists have found that abandoned pasture and cropland regain the carbon (biomass) levels typical of full forests within 50 years. At first, the invaders are shrubs and tree saplings competing for sunlight and soil. In time, some trees begin to out-compete others, and the thickets thin out a bit. After 50 years, sizeable trees exist, not old-stand forests with mature trees, but full forests nevertheless in terms of the amount of carbon stored in roots, trunks, and branches. From the perspective of the CO2 being removed from the atmosphere, it is as if the land has completely reverted to forest in just 50 years. Here, then, is a possible mechanism to pull CO2 out of the atmosphere in a few decades: widespread reforestation as a result of pandemic mortality. Imagine the following scenario. During the years before the plague hits, gradual deforestation has been slowly removing carbon from the land at rates typical of the interval between 8,000 years ago and the industrial era. As a result, atmospheric CO2 levels have been slowly rising. Then a pandemic strikes, causing mass human mortality, widespread farm abandonment, forest regrowth, and CO2 removal from the atmosphere over the next 50 years. The rates of CO2 removal in reforestation are much higher than the very gradual rates of CO2 addition from deforestation, and 50 years or so after the onset of the plague, CO2 concentrations have fallen to a minimum value. At this point, several scenarios are possible. If the pandemics end, people will soon begin to reoccupy the farmland, cut back the newly grown forest, and restore the farmland to agricultural use. As they do so, carbon will be returned to the atmosphere, and CO2 levels will rise rapidly back to the preplague trend. But if repeated outbreaks of plague occur at decadal intervals following the initial outbreak, over a century could pass before the farms begin to be reoccupied. 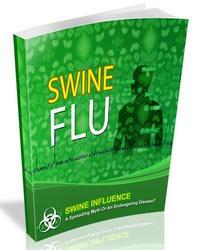 History shows that the patterns of the major pandemics were all different. The plague of Justinian in ad 540—542 was the culmination of several centuries of prior epidemics of increasing intensity, and it was followed by more than a century of less-severe outbreaks. Populations in most of Europe didn't fully recover until the start of the medieval era around ad 1000, many centuries later. In contrast, the Black Death struck without warning in 1347—1352 and was followed by several outbreaks, yet populations in most of Europe had somehow rebounded to previous levels by 1500. The American Pandemic after 1500 had no real end: indigenous populations had not even begun to recover when major European settlement started in the middle and late 1700s. One aspect of the Roman-era and Black Death pandemics that struck me as curious remains unexplained. During the same centuries that plague was decimating Europe, populations in China were falling and then recovering in almost identical patterns (see fig. 13.1). Because China and much of Europe had numerous census counts throughout these intervals, this striking similarity in population changes is hard to reject as some kind of artifact of historical inaccuracies. Yet most of the primary sources on the history of disease do not mention bubonic plague in China during these intervals, or anywhere else east of Iran. In any case, I omitted China from my assessment of the effects of reforestation on atmospheric CO2 during both the Roman and medieval eras. Largely anecdotal historical evidence indicated that all of the arable land in China had been deforested some 3,000 years ago, at least in the populous north-central regions. By that time, China had passed the population density of11 people/km2 that caused near-total deforestation of England in 1089 (the Domesday Survey). I reasoned that the large excess of people available in China would have occupied any farmland abandoned during the population drops of the Roman and medieval eras, so that reforestation would have been minimal despite the enormous mortality at those times. The carbon sequestered in the growing trees does not come entirely from the atmosphere. The atmosphere constantly exchanges carbon with the surface layer of the ocean and with all of the world's plant matter (both terrestrial and marine) within a few years, so these other reservoirs would also have contributed their share to the carbon used for reforestation. These contributions reduce the amount of CO2 required from the atmosphere. Allowing for all these factors, I found that reforestation after each pandemic would have been large enough to account for the observed CO2 decreases of 4—10 parts per million. It also occurred to me that pandemics could have caused a drop in the concentration of CO2 in the atmosphere by slowing the global-average rate of deforestation. Although CO2 was constantly being added to the atmosphere by deforestation over many millennia, it was also constantly being removed by uptake in the ocean. The processes that transfer CO2 into the deep ocean work far more slowly than the changes in the rate of deforestation caused by a major pandemic. If a pandemic abruptly reduced the rate of CO2 input, but the rate of removal to the ocean slowed only a little, the total amount of CO2 in the atmosphere would have to drop. Major pandemics are likely to have brought deforestation to a complete halt in the afflicted areas, based on historical evidence that reforestation actually occurred in such regions instead. These abrupt halts to deforestation across the stricken regions would then overwhelm the slow, steady deforestation still occurring in parts of the world spared by the pandemic. As a result, the global-mean rate of deforestation would drop, and atmospheric CO2 concentrations would follow. Humans could also have contributed to the CO2 drops in a third way. In north-central China, where deforestation had occurred more than 2,000 years ago, most people are thought to have burned coal for heat and cooking. The massive levels of mortality during the Roman and medieval eras would have reduced CO2 emissions from coal burning by amounts roughly proportional to the population losses in those regions. All of these factors—reforestation, reduced deforestation, and decreased coal burning—would have reduced atmospheric CO2 concentrations. If natural (solar-volcanic) changes cannot provide an explanation, humans must have been an important factor. One implication of these results is that CO2 changes driven by pandemics could have played a significant role in climatic variations over the last 2,000 years. For a climate-system sensitivity of 2.5°C to CO2 doubling, pandemic-driven reductions of CO2 levels by 4 to 10 parts per million would have cooled global climate by 0.04 to 0.1°C. Such coolings would represent a significant fraction of the temperature changes observed (see fig. 12.3) between the cooler Roman era (200-600), the warmer medieval era (900-1200), and the cooler Little Ice Age interval (1300-1900). None of this rules out a role for solar-volcanic factors in these temperature changes, but the pandemic idea does manage to explain the size of the CO2 reductions without violating the reconstructed temperature decreases, whereas natural solar-volcanic processes did not pass that test. 14.1. Surrounding small ice caps on Baffin Island that are rapidly melting today are halos of dead lichen that were smothered by the thick year-round snow cover prior to the 1900s. changes) caused the CO2 level to drop by as much as 10 parts per million. In effect, the pandemics eliminated a substantial fraction of the human-produced greenhouse "defense" that had been holding off a renewed glaciation. This abrupt CO2 drop brought the climate system closer to the point of that long-overdue glaciation. Indications of how close northeastern Canada may have come to being glaciated a few hundred years ago can be found on Baffin Island. There, as noted in chapter 9, several small ice caps today lie perched on the high plateau terrain. Surrounding these ice caps are large halos of dead lichen (fig. 14.1). These lichen halos are ghostly remnants of an ice age that nearly got under way during the Middle Ages. Lichen are thin, green-gray blobs that grow on the surfaces of trees and rocks. Like other vegetation, lichen need sunlight, CO2, and nutrients to power photosynthesis and permit growth. The Sun provides the needed light, and CO2 is readily available from the air. But in contrast to most other forms of vegetation, lichen obtain nutrients from an unusual source: the seemingly inhospitable surfaces on which they grow. The lichen attack the rock and break it down into its component minerals and elements, which they then use as nutrients. Arctic lichen are also well adapted to extreme cold, since winter nights are often many tens of degrees below zero. As a result, extreme cold cannot kill the high-Arctic species. Yet something did kill those areas of lichen and produce those ghostly halos. The only plausible explanation seems to be that the lichen were denied sunlight, and the best way to cut off sunlight is to bury them under thick piles of snow that are replenished in winter and never entirely melt in summer. So the dead-lichen halos are thought to be remnants from a time when permanent snowfields covered large areas of high terrain on Baffin Island. Living on these same plateau crests today are younger lichen that have grown within the last 100 years. The interval during which these newer lichens have been growing corresponds to the recent warming since the end of the Little Ice Age. Taken together, the evidence tells this story: lichen once grew in the regions where now only the halos exist, then they were killed by the accumulation of permanent snowfields, and still later, about 100 years ago, the snowfields began to melt and new lichen began to grow. Decades ago, this evidence led scientists to conclude that the expansion of permanent snowfields that killed the earlier generation of lichen occurred during the Little Ice Age. When snow persists from year to year in permanent snowfields, it gradually turns to granular snow (firn) and then to ice because of the pressure of the overlying snow and other processes. At first, the snow and firn and ice simply pile up in place but do not move. Only when the thickness of ice reaches several tens of meters does it begin to flow, at which point it can be called a glacier. 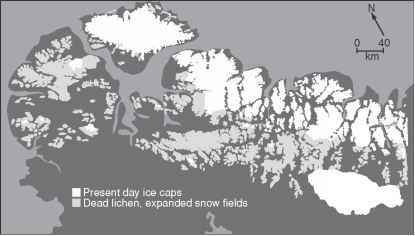 As far as is known, the snowfields (or ice fields) atop Baffin Island during the Little Ice Age never thickened enough to flow, so technically they were not glaciers and this was not the start of a glaciation. But they were obviously a significant step in that direction. In the same sense, the Little Ice Age was not really an ice age, just a time of slightly cooler climate. Still, in that one region of northeastern Canada, a first small step in the direction of a real ice age did occur, for a few centuries. 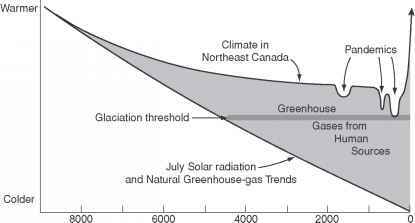 I concluded that this small step toward glaciation had resulted in part from the drops in atmospheric CO2 values caused by the American pandemic after 1500, combined with natural solar-volcanic changes (fig. 14.2). If such a small CO2 drop (10 parts per million) had helped bring this region so close to a state of glaciation, then it seems likely that a significantly larger portion of northeastern Canada would have been glaciated if the remaining CO2 anomaly as well as the methane anomaly caused by humans were removed from the atmosphere. The pandemic/CO2/climate connection has other implications. As noted in chapter 13, some climate scientists and historians have hypothesized that intervals of cold climate produce famines that cause population decreases, at least in highly vulnerable regions of the far North. During times of cold, wet weather, crops freeze or rot in soggy fields, and people starve. Cold has also been suggested as a cause of disease and death in populations weakened by hunger. 14.2. CO2 drops caused by major pandemics probably brought parts of northeastern Canada to the threshold required for renewed glaciation. 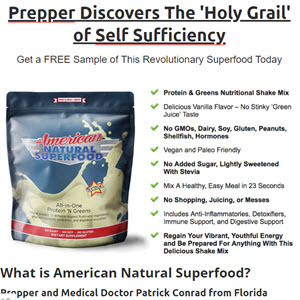 must in general be good for humanity, and that cold climates must be bad. This conclusion has been injected into the global warming debate: any future greenhouse warming must be a good thing for humanity. But does such a link between climate and population really make sense on a global scale? Historians have generally been resistant to this form of "environmental determinism"—the idea that climate is a major control on human population. One of their criticisms is that even the extreme decades of the Little Ice Age are thought to have been no more than 1—2°C cooler in winter, and only a few tenths of a degree cooler during the summer growing season. A second problem is that temperature drops of this size occurred only in far-northern and high-altitude regions, while subtropical and tropical latitudes and lower-elevation regions cooled even less. Very few people actually live at the high altitudes and latitudes where the larger coolings occur, because agriculture in such places is marginal during the best of times. As a result, crop failures and famines in those regions have little or no impact on a continental or global scale. Most of humanity lives in the tropics and moist regions of the subtropics and has done so for millennia. To those at warmer latitudes, a small temperature decrease might well be welcome, if a cooling of a few tenths of a degree centigrade were even noticed. The major part of the world's population would seemingly not be impacted by a Little Ice Age cooling in any significant way. Still, the data (see fig. 13.1) do suggest some correlation between global population and climate. Even though "correlation is not causality," this apparent correlation invites an explanation. My findings provide a possible answer: both the cooler intervals and the simultaneous population losses are independent responses to pandemics. Pandemics cause massive population losses for obvious reasons, but they also cause CO2 reductions that contribute to cooler climates. In short, population losses do indeed correlate with cold intervals, but they are not caused by them. The common causal factor here is disease. The connection between pandemics and CO2 is also relevant to studies of estimated carbon emissions during the early part of the industrial era. Reconstructions of carbon emissions caused by land-use changes extend back to ad 1840, with cruder extrapolations back to about 1800. The current interpretation of the trends during the late 1700s and early 1800s is that land clearance had begun to increase early in the industrial era but had not yet accelerated as abruptly as it would after 1840. The pandemic/CO2 hypothesis adds a new factor to consider in these reconstructions. The American pandemic was still in full effect when the industrial era began because indigenous populations had never recovered from the decimation caused by European diseases. As European settlement began, huge expanses of forest were cut, usually beginning with the prime bottom land in and near fertile river floodplains. Almost all of these areas were the same regions that had once been cleared, densely occupied, and heavily farmed by native Americans but had reverted to forest after being abandoned. By implication, the rather high rate of deforestation and carbon emission in the Americas during the 1700s and 1800s was not entirely the result of a first cutting of virgin forest; it resulted in part from a recutting of forests that had initially been removed much earlier by indigenous peoples but had later grown back as millions of people died. If so, some of the clearance that has been included as part of the early industrial-era total actually represents a recovery from the impact of the American pandemic. Finally, the results summarized in parts 3 and 4 of this book greatly complicate studies of climatic changes over the last several millennia. Until now, one of the primary reasons for studying these earlier intervals has been to define the natural behavior of the climate system prior to the onset of significant human impacts that were assumed to have begun 200 years ago. The goal has been to quantify the natural behavior of the climate system accurately so that we can isolate and clarify the effects of humans on the planet. But now it seems that no part of the last several thousand years of climate change is actually free from potentially significant human impacts. Good reasons still exist for studies of recent millennia and centuries, but the more important (and more difficult) task may now be to separate human impacts on climate from natural variations.